Commercial gas training is crucial for engineers wishing to work on the large-scale and often lucrative projects in the commercial sector. With a wider variety of heating requirements, and increasing pressure to improve efficiency, technology in this field is ever changing, creating a challenging but exciting working environment for gas engineers with the right skills. 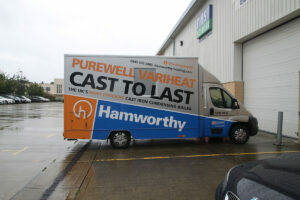 Leading the way when it comes to commercial heating and hot water solutions is Hamworthy Heating. They dropped by Logic4training Northolt recently to show us their highly efficient Condensing and Non-condensing, Modulating Purewell VariHeat boiler. 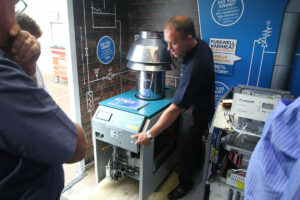 As you can see from the photos, the van was well kitted out, including one of Hamworthy’s older atmospheric boilers. 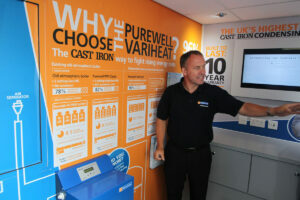 We were shown common mistakes made when choosing and servicing commercial boilers, as well as being told about the massive savings installing a Purewell VariHeat can achieve. “Hamworthy have designed the Purewell VariHeat to retain all the benefits of the traditional cast iron boilers but with vastly improved performance to more than meet the emissions and efficiency requirements for modern day boilers. 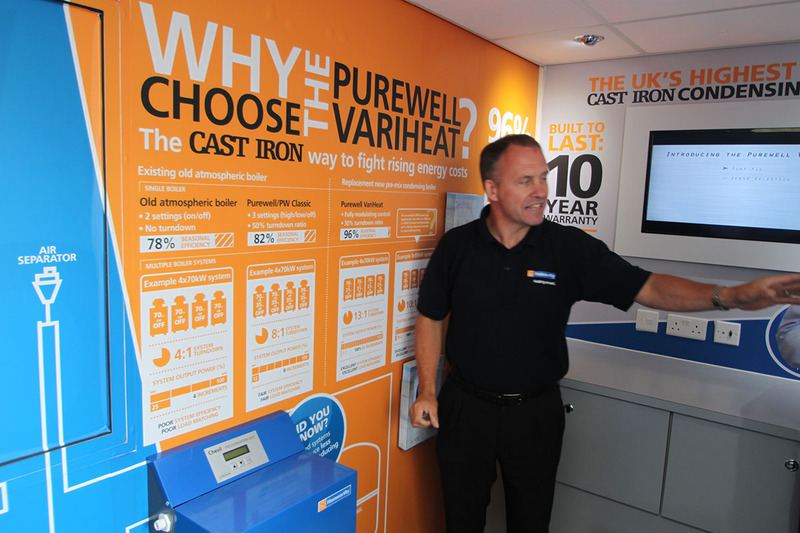 At 25mg/kWh NOx emissions, the Purewell VariHeat boiler easily achieves European Class 5 performance. This package includes training and assessment on changeover domestic to commercial core gas safety, installation first fix of commercial pipework and appliances, commission, service, repair and breakdown of 3 commercial appliances and tightness testing and direct purging of installation pipework. This package course includes training and assessment on commercial core gas safety, installation first fix of commercial pipework and appliances, commission, service, repair and breakdown of 3 commercial appliances and tightness testing and direct purging of installation pipework. This course is for operatives who already hold the Core Domestic Gas Safety (CCN1) qualification and who want to upskill to undertake commercial gas work. 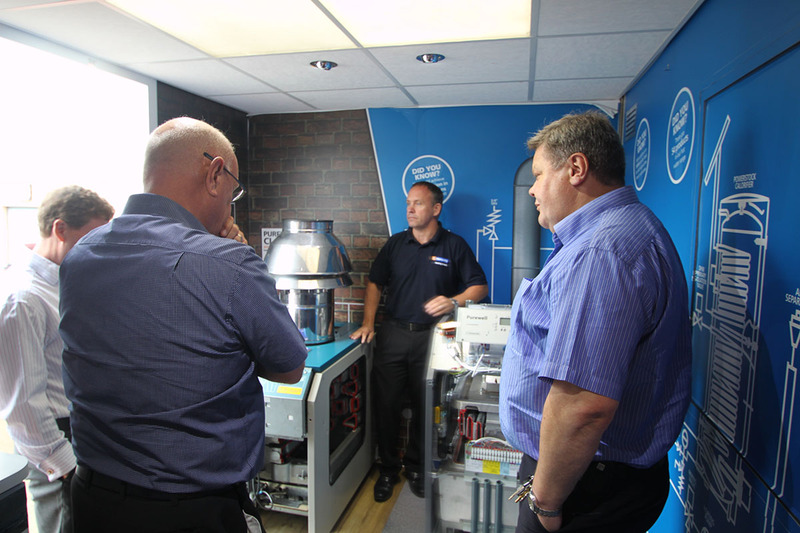 The course includes 6 days of in depth training on the different appliance types, flues, controls and systems that can be commonly found in the commercial gas field. 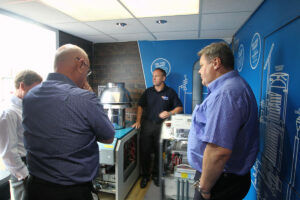 The New Entrant Commercial Heating Approved Prior Learning (APL) course is an in-depth training programme covering all aspects of core commercial gas safety. The course is recognised under the Nationally Accredited Certification Scheme for Gas Fitting Operatives (ACS) as a pre-requisite Managed Learning programme, prior to assessment and application to be accepted on the Gas Safe Register. For operatives who just want to top up their skills or need an individual module Click Here.